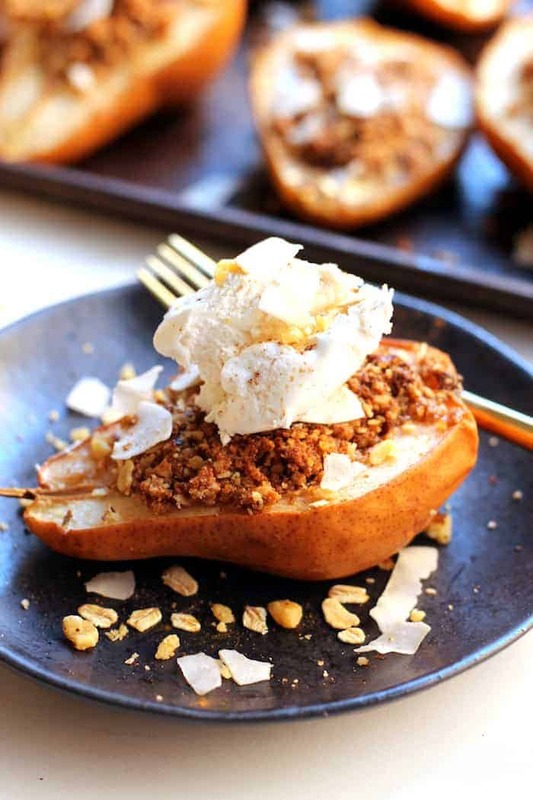 Enjoy this Healthy Stuffed Pear Crisp made with just 10 ingredients for the perfect holiday treat! Free of refined flour, sugar, and butter, they’re a decadent treat you can enjoy all season long! Vegan and gluten-free. Fuzzy wuzzy was a pear. I recently chatted with a friend who preferred nectarines to peaches because the fuzzies creeped her out. I on the other hand adore peaches because of those beloved fuzzies. I mean they’re the only fuzzy fruit!! Unfortunately pears aren’t fuzzy. And these adorable little Stuffed Pear Crisps aren’t fuzzy, either. 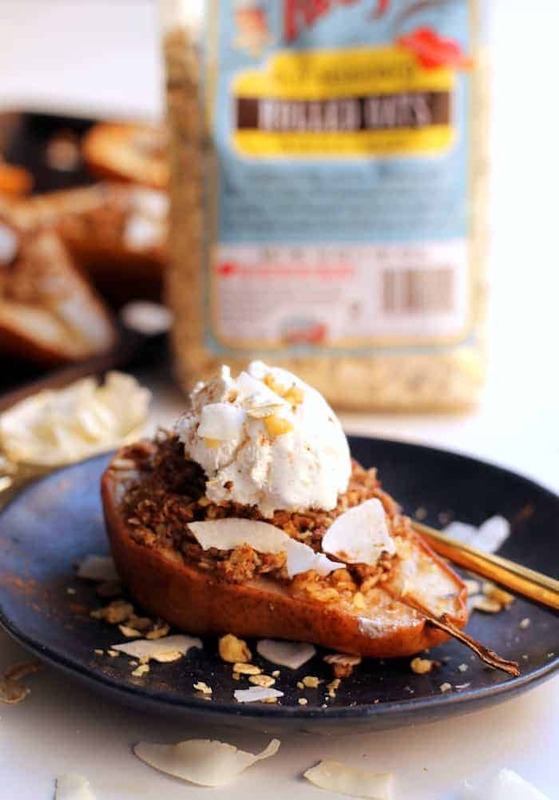 BUT, but…they give me the warm and fuzzies on the inside when I take a bite of that juicy pear chock full of what tastes like crumbled cinnamon cookies below melted coconut whipped cream. It’s 110% guaranteed to tickle your fruit fancy. You may have noticed I used my go-to Bob’s Red Mill rolled oats and oat flour because I legit use Bob’s for any and all flours and baking goods. Coconut flour, almond meal, flax, steel cut oats, you name it. I like that they’re all next to each other in the store so I don’t have to bop around eighty different places for my quirky food blogger flour needs. It ain’t a short list. 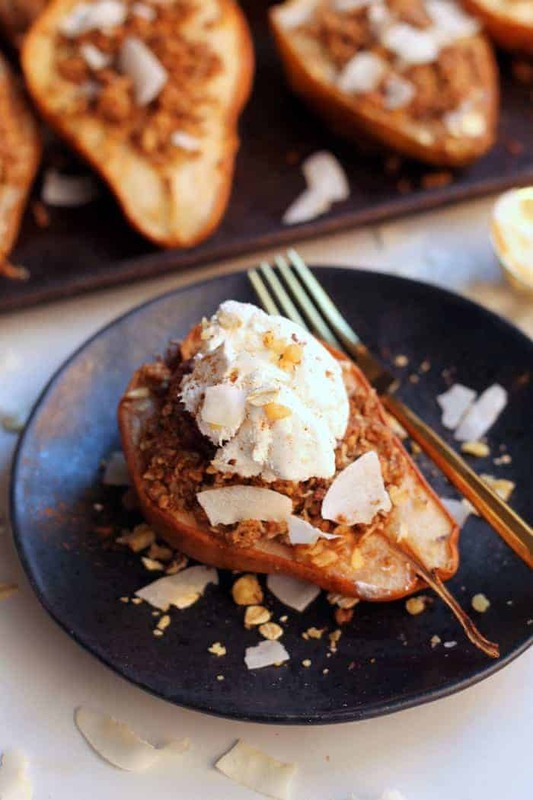 The idea for this Stuffed Pear Crisp recipe stemmed from the best stuffed apples my mumsy made when we were growing up. I vividly remember watching her core all the apples. This version calls for pears to change it up a bit. They really are super drool-worthy when baked, but I bet apples would work just as well. Be sure to use ripe pears (like the one’s you’d want to eat) or else they’ll be too hard to scoop out and not as tender post-oven. You could easily eat the filling on its own, so kudos to you if it even makes it into the pears. It’s like a cross between granola and cookie dough batter. NOMMY DREAMS. P.S. If you’re in the market for a fall candle, don’t bother. Just whip up a batch of these and let your nose do the talking. You may also notice that pumpkin pie spice is listed in the ingredients. Is that odd? Perhaps. Really it’s simply too glorious of a spice blend to let go of just yet. It’s not December, pals. Don’t you forget it! Preheat oven to 350F. Form a cavity in each pear for the filling. Arrange prepared pears in a baking dish sprayed with cooking spray. Set aside. Place oat flour and coconut sugar in the bowl of a food processor. Add coconut oil and vanilla and pulse until the mixture resembles small crumbs. (Alternatively, you can do this step in a bowl using a pastry cutter). Add the oats, walnuts, cinnamon, pumpkin pie spice and salt. Process for about 20 seconds longer, or until well-combined. Fill each pear half with a couple spoonfuls of the topping. Place evenly in baking dish. Bake for 32-35 minutes or until pears are tender (use a fork to test if you’re not sure). This post is sponsored by Bob’s Red Mill. Thanks for supporting the brands that make Hummusapien possible! YUM! Gimme all the crisps. 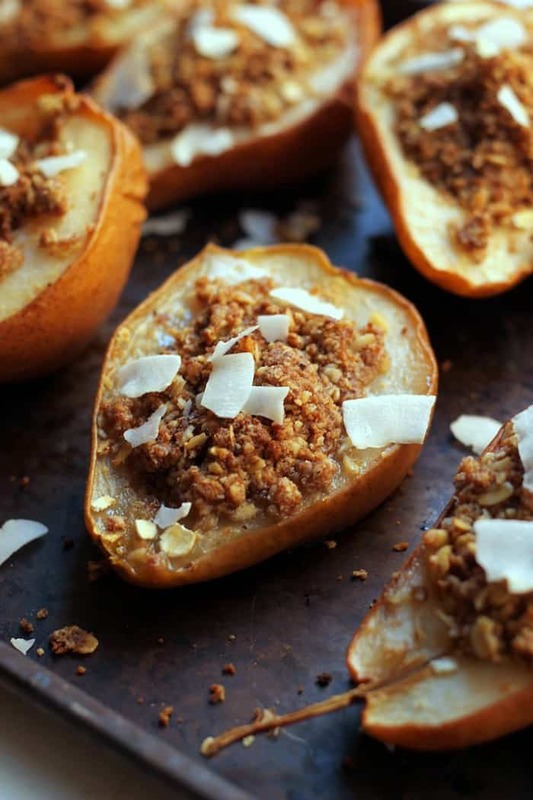 I love the texture of baked pears plus a little crisp for crunch! The crisp life is the good life! I love this healthy twist on crisp! It looks delicious! What is the topping in the photo? Ice cream? There are white flakes of something in the pictures. What is that? It’s vanilla ice cream :) Flakes are coconut! Looks amazing! Need to hunt me down some pears! YUM! I’m going to make this for Thanksgiving tomorrow as an alternative to pie. Thanks for sharing! and beautiful photos, as always! I had one pear left over after making another recipe a few days prior, and decided to try this scaled back to 1/4 of the recipe and it turned out great! It’s a lovely and light dessert that’s very easy to whip up!